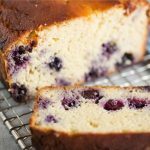 Low Carb Blueberry Cake - a perfect keto low carb treat! 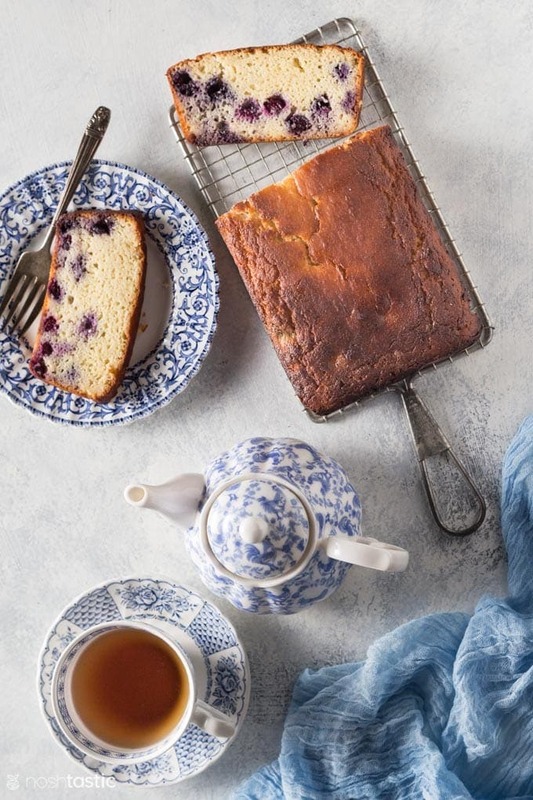 Low Carb Blueberry Cake is a fabulous treat to have with your afternoon tea, or if you’re like me you’ll eat it for breakfast too which is basically having your cake and eating it! 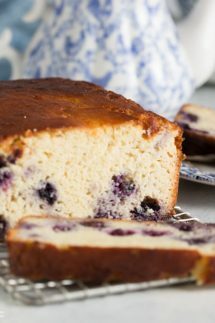 This Low Carb Blueberry Cake is similar to pound cake but given that it’s made with mostly almond flour it’s got a wee bit of a different texture, but then if you’ve ever baked anything low carb or keto then you know what to expect. I was able to get about 12 slices of cake, so that comes in around 5g net carbs per slice and around 60g net carbs for the entire cake. Obviously if you make bigger or smaller slices the carb count will vary. Start by measuring out all your ingredients. 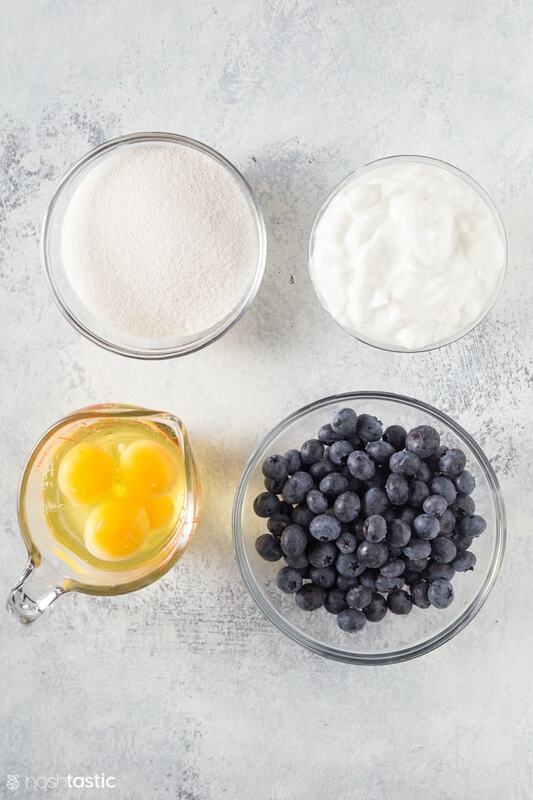 In the two photos below you can see the low carb powdered sugar, yoghurt, eggs, blueberries, almond flour, lemon zest, vanilla extract, butter, salt, and baking powder. 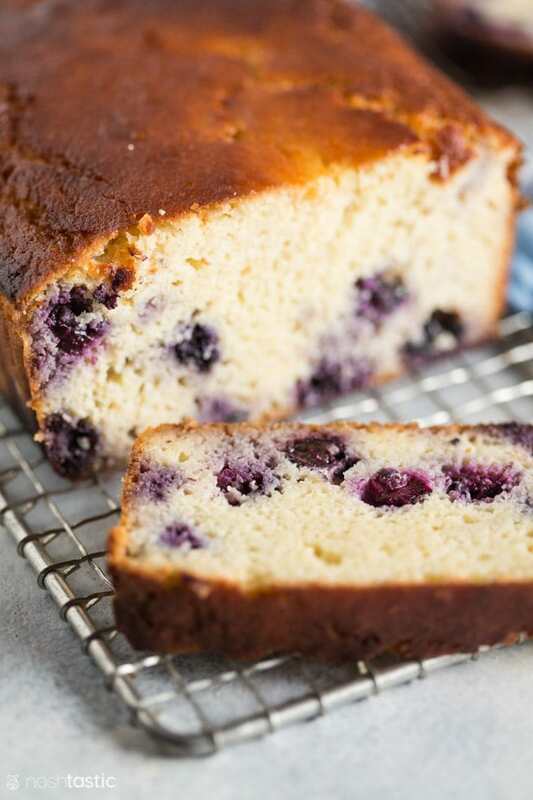 Next you want to preheat your oven so that by the time you’ve finished mixing all the ingredients for your low carb blueberry cake, you can pop it straight into the oven without waiting. Now mix the dry ingredients (but not the blueberries) together in one bowl and then put the wet ingredients together in another bowl and mix those also, then blend them all together. 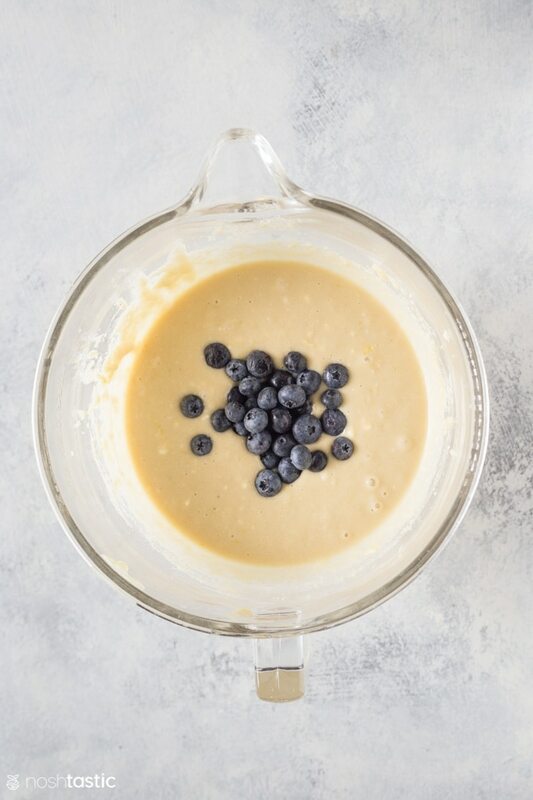 Once your low carb blueberry cake mixture is well combined, add the blueberries and fold them in with a wooden spoon, you don’t want them to break up if you can avoid it. 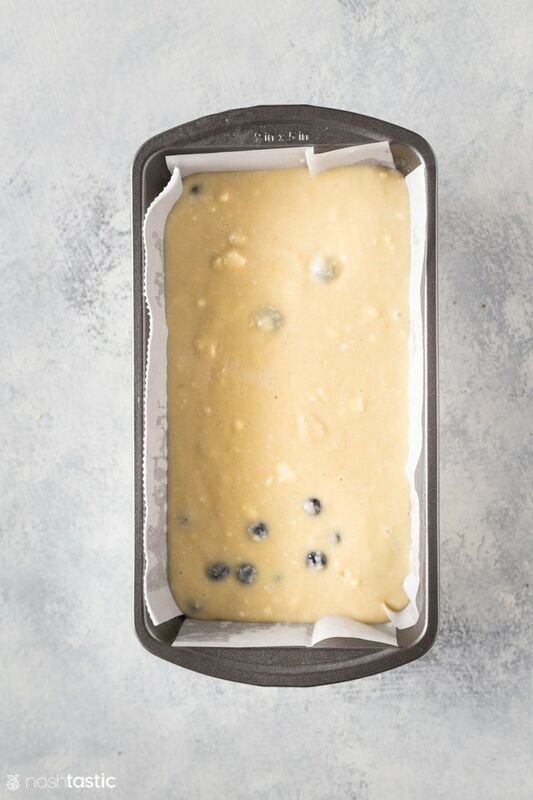 Now pour the mixed cake batter in an an already lined cake pan, I alway use parchment and not waxed paper for this, and then put it into your preheated oven and bake for about an hour or until a toothpick inserted into the top of the cake comes out clean. Then remove the cake from the pan and let it cool on a cooling rack. I know you’ll want to dig in already but it’s better if you let it cool fully before cutting into it. What’s the best low carb sweetener to use? My favorite low carb sweetener is Lakanto, I’ve tried as many different low carb sweeteners as I could find in the grocery store and online and this one tasted the best to me but more importantly to my family members who although not low carb will be eating anything I bake, so their opinion matters! I love their blend of monkfruit and erythritol the best and it has very little of that strange aftertaste that some low carb sweeteners have, I used it to bake this cake. I find that compared to stevia on its own this has a much more palatable flavor and their granulated monkfruit blends are excellent for low carb and keto baking recipes. 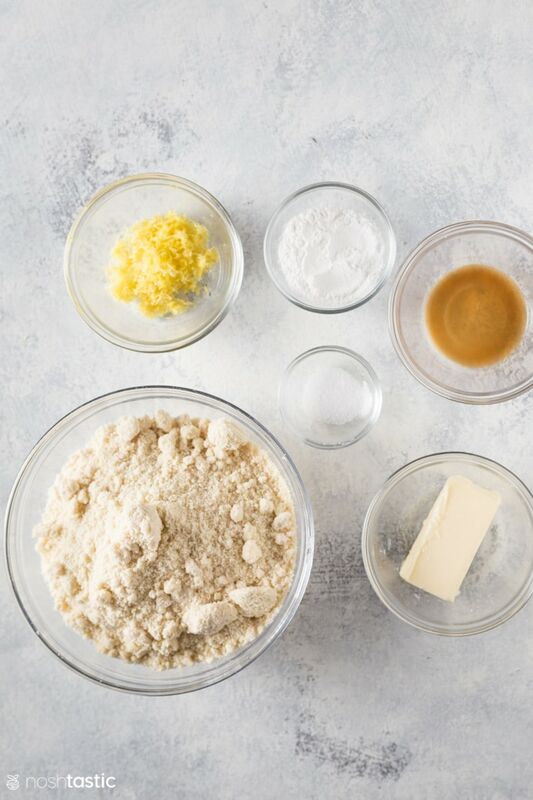 In a bowl whisk together the almond flour, baking powder, and salt. Set aside. In another bowl, whisk together low carb granulated sweetener, yogurt, eggs, softened butter, lemon zest, and vanilla extract. Pour the cake batter into the parchment lined pan and bake for 1 hour or until a toothpick inserted into the top of the cake comes out clean. Remove the cake from the pan and cool on a wire rack. Wait until it's fully cooled before cutting into it. 5g Net Carbs Per slice, not including carbohydrates from the low carb (erythiritol) sweetener. I love the taste of the granulated monkfruit/erythritol blends from Lakanto and it's what I used to bake this low carb blueberry cake. I especially love the Golden Monkfruit 1:1 Sugar Substitute, it's the best tasting low carb sweetener I've tried and I highly recommend it for baking and anywhere you need to replace sugar in recipes. You can get a 20% discount with my link, just enter the code NOSHTASTIC at the checkout. 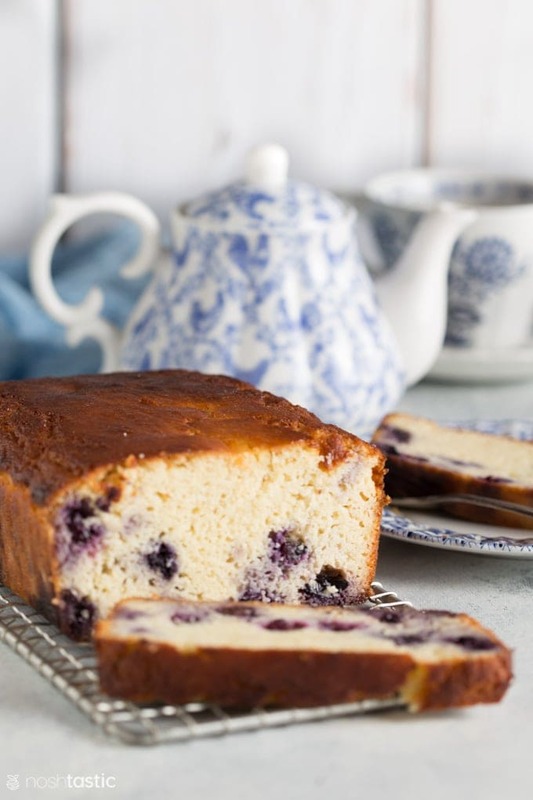 This blueberry cake was delicious and easy to make. Wow this made my morning a delicious low carb treat. How is the net grams of carbs 5g when the total carbs is 19g, dierty fiber is 2 grams and sugar is 2 grams. Then doesn’t the net grams of carbs is 15grams? Because we don’t include the carbs from the sugar alcohol in the net carb count.